The Lower Town Arts & Music Festival (LTAMF) is a regional two-day celebration of art, music, food, beer and wine all from a 350 mile radius of Paducah, Kentucky. LTAMF takes place in the Lower Town Historic Arts District near Downtown Paducah. With a commitment to honoring and presenting the culinary, artistic, and musical talent of the region, LTAMF is a growing premier festival that boasts a family-friendly environment with major economic impact right here at home. The neighborhood of Lower Town has undergone a dramatic makeover due to our city’s leap of faith and the imagination of a group of artists. The city of Paducah created The Artist Relocation Program back in March 2000 in order to revitalize the decaying Lower Town neighborhood. Since then The Artist Relocation Program has become a national model for using the arts for economic development. At a time when funding for the arts was being cut, Paducah fostered an environment where artists and the arts could flourish. The goals of the program were to revitalize one of Paducah’s most historic neighborhoods through the Arts. Properties were offered by the city at little cost (often as low as $1) , the intrigue of becoming a part of a true art enclave proved irresistible. To date, Lower Town artists/residents, primarily through a generous and innovative financing arrangement offered by community partner Paducah Bank, have invested over $30 million in restoring this model community to its previous glory. As you walk around the Lower Town Historic Arts District today you’ll find working artist studios & galleries, event venues, a coffee house, eateries, and beautifully restored historic homes. LTAMF is now a program and fundraiser for the Yeiser Art Center (YAC), a 501c3 non-profit arts organization founded in 1957. Located in Downtown Paducah, just a few blocks away from the festival, YAC hosts annual exhibitions in its gallery, has a five week summer art camps program in partnership with MAKE, and puts on various fine arts events like the LTAMF, Paducah Fall Fiber Festival, and art activities in partnership with Paducah Parks Department. It also maintains a permanent collection of over 200 art objects, including a drawing by Mary Cassatt, a print by Francisco Goya to paintings by Mary Yeiser and Harlan Hubbard. 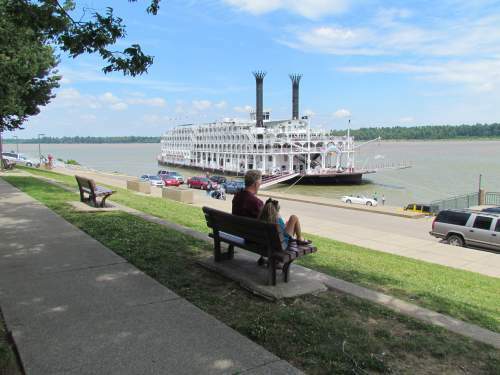 Located at the heart of America’s inland waterways, the river contributes to the constant flow of creative energy and fascinating history in Paducah, Kentucky. As a UNESCO Creative City, innovative artists and far-reaching attractions and events add to Paducah’s vibrant artistic landscape. Festivals and annual events, like the Lower Town Arts & Music Festival, honor local heritage and culture, highlighting each season of the year with celebration. Learn more about Paducah at paducah.travel! The Mission of the Lower Town Arts & Music Festival is to introduce the art, music and food of our region for the purpose of cultural enrichment and economic growth. We believe all the arts play a major role in shaping the lives of the people of Paducah and it’s surrounding area. The Festival creates an experiential learning opportunity through accessibility, entertainment, and inclusiveness, allowing festival goers to become familiar with the regional arts and to encourage their support through attendance and patronage. AND, the festival is a fundraiser for the Yeiser Art Center! Donations and money earned from the festival directly benefit this nonprofit arts organization.